BinaryOptionsNow – Those traders and investors who are used to trading forex and/or options using third-party buy and sell signals may be interested in receiving binary options signals as well. For those of you new to the world of signals, binary option signals are notifications that are sent via, e-mail, SMS or chat in which traders are given a call or put signal telling the trader when and how to invest in a particular binary option in order to make a profit. So, for example, a binary option signal would tell a trader what binary option to invest in, which direction to select (ie Up or Down), what expiry time to choose and when to execute the trade. In our quest to see what currently exists for traders looking for binary option trading signals, we came across BinaryOptionsSignal.com – website that offers call and put signals for binary options trading with live, verifiable account screenshots everyday that show the results of the signals they execute. At the time of this writing, this signals provider claimed an accuracy rate of approximately 72%, which it is quite high as compared with other signals providing services. Despite the somewhat high price ($199/week), we figured that it was worth giving BinaryOptionsSignal.com a try since the provider seemed to be so transparent about the success/failure of its signals and if the signals are as accurate as they claim, the $199 per week investment could quickly be repaid with successful binary option profits. There is not much information to give about this website or service. Their website is very simple and does not tell much about who is behind it. The person we communicated with via Yahoo instant messenger was friendly and cordial but never gave a name or any indication about who he is, which seemed a bit strange at first, but at the end of the day, if the signals are accurate, that’s all that matters. BinaryOptionsSignal.com recommends using BancdeBinary.com as your binary options broker when trading according to their signals. You can create a free account with Banc de Binary by clicking here. We tested the signals on Banc de Binary. The only real criteria for using their signals is that you make sure that your chosen options broker provides the same realtime market quotes as those on Banc de Binary. Some binary brokers may offer a different spread on their options’ quotes so it’s important that you make sure the broker you’re using is using the same information that the BinaryOptionsSignal guys are using. If you want to be on the safe side, invest with Banc de Binary when you’re using BinaryOptionsSignal.com’s services. Once you’re ready to invest, you must have a Yahoo instant messenger account in order to receive the signals in real time. You can create a free Yahoo and download the messenger program here. They offer versions for both Mac and PC so everyone should be able to create an account and use the messenger software. 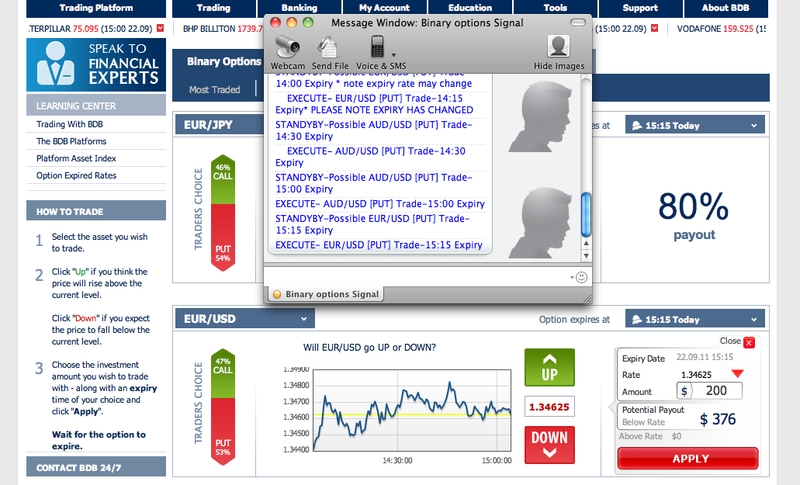 Our first day of trading using BinaryOptionsSignal.com’s binary signals was OK, but not great. We placed three successful trades and 2 unsuccessful trades of $200 each for a total daily trading profit of $116. It still doesn’t cover the cost of the service for the week, so we still needed to trade a few more binaries before being proitable for the week but it was a decent start. Overall, our experience with BinaryOptionsSignal.com was very positive. The signals are communicated in a reiable, timely, effective manner and – most importantly – they were successful. I think the price may turn some people away, although their signals provider tries to put the price into perspective by calculating that $199/week is a small price to pay if you’re able to make a profit of $1000/week. In any case, this product is bound to attract a lot of attention so it may be worth keeping your eye out for these guys and seeing how their product develops over time.